Ted Covey didn’t quite make all 46 matches, but he and his wife Chris proved to be the most regular CTSA customers this season. 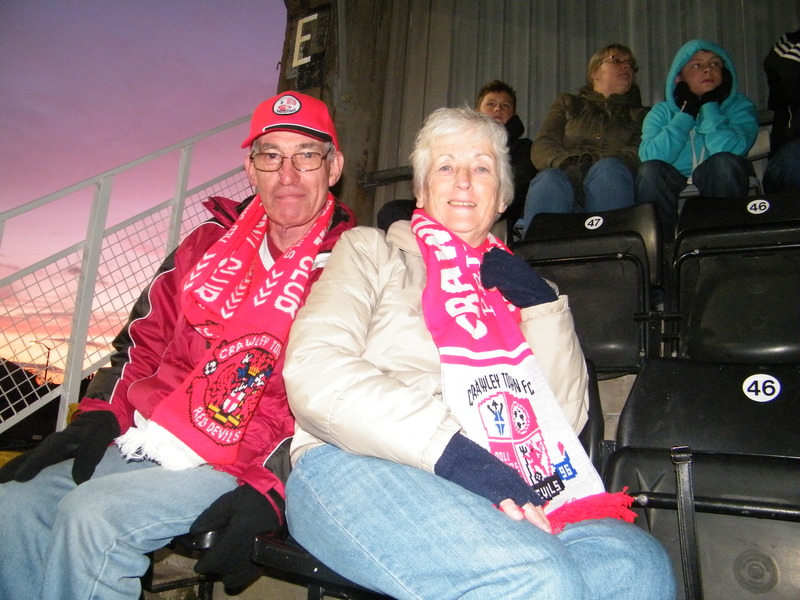 Chris managed the distinction of attending many, many more away matches than home matches, only making her Broadfield league debut against Hereford; and even then having to sit opposite Ted- divided by the entire width of the pitch as she made her debut in the East Stand. 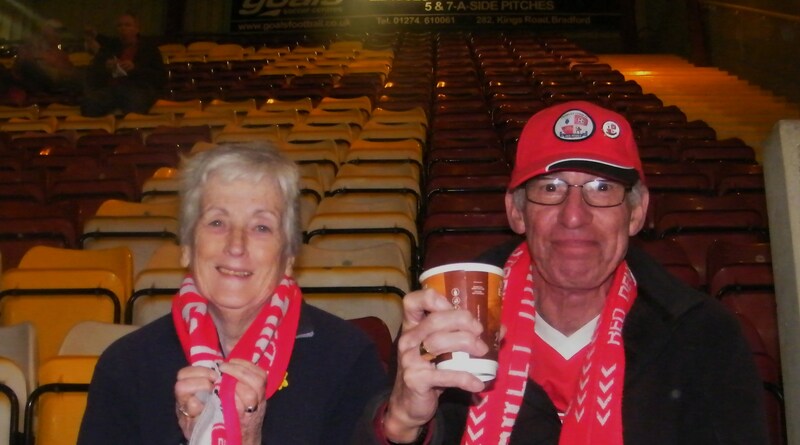 I caught up with the couple during the long trip up to Accrington to discuss the ebb and flow of the league season. There follows an official “Ted and Chris Review of the Year!” They both made the trip to Port Vale (2-2) for the opener. Ted said, “we played very well that day and I was very disappointed that we didn’t win. But we’ve made up for that disappointment since”. During the early part of the season both particularly enjoyed the away wins at Aldershot (1-0) and AFC Wimbledon (5-2). During their Christmas holiday they missed a couple of games. Ted said, “If I had to miss a home game I’m pleased it was the home match with Gillingham. I’d rather miss the defeats than the victories”. But it was a rare missed game. We discussed our spring slump- though it seems a little churlish to call it that, given we didn’t lose many at all. Ted commented, “there were a few disappointing results along the way, we weren’t losing many but didn’t seem to be picking up many wins. It was a little concerning. Chris added, “I was gutted when we drew with Macclesfield, letting in two goals in the last five minutes. We shared a very disappointed coach on the way home, it almost felt like a defeat”. It all came good on Saturday 17th March when we started a 4 match winning streak. Both really enjoyed the one nil away win at Gillingham (1 -0) 3 days later, though not the long walk back to the coach afterwards. Say what you like about Gillingham (please do), but it’s hardly photogenic- it makes Stevenage look pretty! Automatic promotion all came down to a win at Accrington Stanley (1-0). Both were very confident of the correct result and as they say the rest is history. Chris said, “I would like to thank you to CTSA for all their hard work which has enabled us to travel around the country and attend loads of games. Clarkes coaches are wonderful and the drivers are a friendly bunch. In turn, we would like to thank both of them for their custom this season and are pleased that they are happy with our service. We look forward to having a pre match beer with them in the stadium bar at Fratton Park or Griffin Park or at MK Dons!